Couples counselor Ted Freeman is still reeling six months after his partner left him. He desperately hopes a week of peace and quiet at a quaint mountain cabin will be just what he needs to regain his personal and professional confidence. Neil Kelly is a computer programmer who just got promoted to full time and is celebrating over Christmas by going on his first real grown-up vacation at the Cabins in the Pines Inn. When he runs into Ted, his longtime crush, Neil can’t believe his luck, and he vows to do whatever it takes to make Ted see him as something other than the dork next door. Neil wasn’t part of Ted’s plan for the holidays, but he might turn out to be exactly what Ted needs. What a cute story this was!! Neil Kelly, the younger computer programmer with his red curls and his fair skin and his case of ‘diarrhea of the mouth’ whenever he meets face to face with Ted Freeman – whom he has been having a crush for the past three years – just seized my heart immediately. I thought he was frickin’ adorable. I loved his friendliness, his outlook towards life and opportunities. I loved how Neil was able to make Ted realize that he needed to readjust his life’s expectations. Neil was the kind of character that just charmed me one hundred times over. On the other hand, Ted was rather distant to me… although I couldn’t really blame him. Being a couples counselor whose partner left him, most definitely shook Ted to the core. Wondering what went wrong with his relationship. I could totally understand how he wanted to brood and think instead of socializing with this younger man. But I thought their relationship progressed nicely. Neil didn’t push and he let Ted have the space and the time needed. So the relationship felt like it was moving at the right pace for me to enjoy – starting from friendship to the hopeful beginning. None of that instant-love that I dislike. Oh, another kudos for Ms. McAllister was that she didn’t exactly portray Ted’s ex in black and white, meaning that he was the only one to blame. I thought there were definitely complicated reasons behind everything. There were signs for both Ted and his-ex on why it didn’t work between them. So I appreciated that. 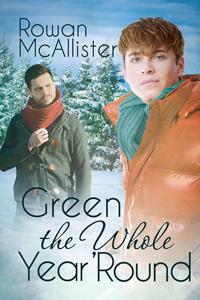 Definitely a heartwarming and wonderful holiday novella! This entry was posted on December 18, 2014 by Ami in Contemporary, Reviewer: Ami and tagged 4 Stars, dreamspinner, holiday, rowan mcallister.